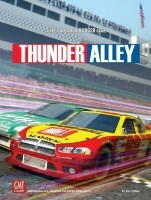 Thunder Alley is a stock car racing game for 2-7 players with the feel and flexibility of a card-driven simulation. Players controls not one car, but a team of 3-6 cars. Each race is not only a run for the checkered flag but an effort to maximize the score for every car on your team. Winning is important but if you race one car to the finish line, your team might end up outside of the winner’s circle looking in. Turns are fast, each play is important and the track situation is fluid. Movement in Thunder Alley allows for many cars to move with one play of the card. If you position yourself incorrectly, you might get left out of the draft and all alone. There are four different types of movement in the game and each has its place and time for use. Solo movement allows you to break away from the pack. Draft and pursuit movement are best used for keeping your team of cars together. Lead movement can create a pack of cars that move toward the front. But the wrong movement in the wrong situation can be disastrous. Experienced players will be able to identify the best type of movement for the current situation. Cars will suffer wear over the course of a race and eventually pit stops will be necessary. Tire wear, suspension difficulties, fuel issues, and major engine and transmission problems are all modeled in the game. If you feel lucky you might try to hold it together just a little bit longer in hopes that a yellow flag will come out and cause a mass rush into the pits. Waiting on a yellow that never comes can be maddening as the rest of the pack moves by your worn-out car. An events deck can make your strategy pay off or punish you for your failure to take precautions. Accidents, Yellow Flags, worsening track situations and deteriorating cars are all part of the game. Will a yellow flag save you or cut your momentum? Could all of your perfect strategy be derailed by those incoming rain clouds? Included in the game will be two very different race tracks, a tri-oval super speedway for wide-open free-wheeling racing and a short track for a tight wheel to wheel bumper car duel. Each track uses the same deck of racing cards but the cards that work best on one may be useless in the other. Drafting, teamwork, accidents, yellow flags, pit strategy, working to lead laps, and sprints to the finish are all included and bring the feel of racing to the game. Most racing games call for a large number of players to play the game at its best. An unusual bonus for Thunder Alley is the very playable and exciting two-player version with six cars on a side. Add a Review for "Thunder Alley"